Above Left: The photograph was taken at Pendelis (1953). From left, we are: my brother, Giorgos, Dimitris (from Plomari) and myself. Above Right: At Melbourne Olympic Swimming Pool, November 1958. In the Heavyweight Class of Wrestling (Freestyle), I am competing against Hans Von Stauffenburg. From December 1956, I turned professional and retired in 1980. 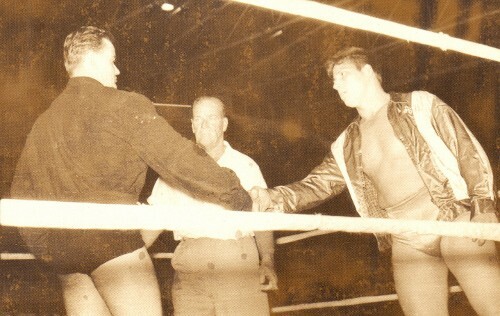 In 1975, my brother, Eustratios (“Charlie”) and I won the Australasian Heavyweight Title in Tag Team. In 1968, I won the Heavyweight Title (Freestyle) in South– East Asia Championships. Above Right: Canberra, 2000. With the then Prefect of Lesvos, Dimitrios Vounatsos (front row, in the middle). I am in the front row, first from the right. 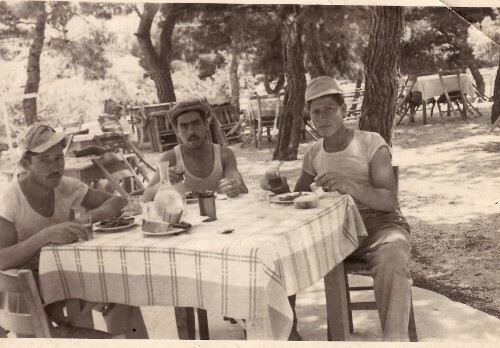 Above Left: My father, Paleologos, came out to Australia for a holiday (1966-67). From left, we are: myself, my father and my brother, Efstratios. Antonios has been an active member of the Mytilenean community of Sydney; having been on the Committee of the Mytilenean Brotherhood of Sydney and N.S.W at various times since 1978. He has served the Brotherhood as President 1980-84, 1999-2001 and 2007-2009.